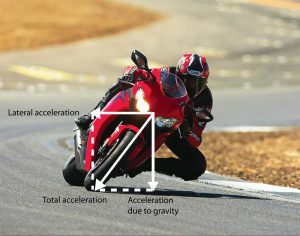 In the G-Forces and Acceleration section of the site we discussed the basics of lateral and longitudinal acceleration, and other aspects of the GPS-specific data that a system is capable of generating. In this section, GPS Data Analysis, we will further break down the acceleration channels into various components. These additional channels will show additional characteristics of interest, again enabling you to quickly see corners or sections that may need attention, either from the rider or a setup perspective. Note that these channels depend on the use of a GPS-based system and the accompanying lateral and longitudinal acceleration channels.